Home > Arts & Culture > Review > Scotland Deformed? 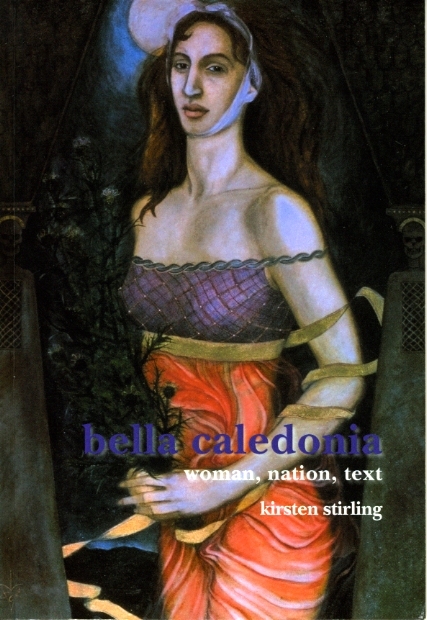 The label “Bella Caledonia” below the portrait of the main character on p. 45 of Alasdair Gray’s Poor Things (1992) – surely familiar to readers of this journal – suggests that Gray wants us to read the character Bella Baxter as a female personification of the Scottish nation, in same tradition as Britannia or France’s Marianne. Bella’s “tall, beautiful and full-bodied” exterior would seem to qualify her for the statuesque role of national figurehead, and her external integrity and beauty form the shell that contains the essence of the nation and the political structures of the state. She sits, with a plaid over one shoulder and thistles on her hat, in a recognisably Scottish landscape (we see the Forth Bridge over her right shoulder). However, since the Frankenstein-like narrative of Poor Things tells us that Bella has literally been constructed by Dr Godwin Baxter, it seems that beneath her elegant exterior this personification of Scotland must be in some way monstrous. Female personifications of nation are always conceptually deformed in some way, if only because symbolically elevating the female figure at the same time symbolically disenfranchises women from the role of national citizen. The Scotland-as-woman figure, however, is subject to additional distortions due to Scotland’s particular political situation. She is pulled in different directions by the clash of national and political boundaries, and this is reinforced by a critical tradition that sees Scotland and Scottish culture as essentially divided. Gray dangles the “Bella Caledonia” tag tantalisingly in front of the reader but leaves it up to us whether to engage with its implications. There are many other paths of enquiry to pursue in Poor Things, and its multi-layered narratives support – and indeed encourage – a number of different readings and interpretations. “Bella Caledonia” may be an incitement to locate Bella in the tradition of women as nation, but if we were to dismiss the nickname as mere hyperbole, as indeed the lady herself insists that we must on p. 251 (“if you ignore the Gainsborough hat and pretentious nickname it shows I am a plain, sensible woman”), then it would be possible to read the entire novel without imposing a nation-as-woman reading upon it. But the suggestion of a nationalist subtext is reinforced by the design hidden under the dustjacket of the hardback edition, which has a pattern of Saltires and elongated Scottish thistles with the legend “Work as if you live in the early days of a better nation”, a slogan which recurs in a number of Gray’s books. The Frankenstein plot suggests, however, that this nation is a construct, and probably a monster. In this passage we can see how Gray arrives at his monstrous version of Scotland. He associates Scotland with other nation-states whose essence is contained within the vessels of their institutional female figureheads. But the stretched and deformed Scotland-as-woman described by Gray conflates the chaste, whole and aesthetically attractive body-shell of the female nation with the much more visceral imagery of the metaphor of the body politic, most famously used in Thomas Hobbes’s Leviathan (1651), where the state is described as an “artificial man”, whose head governs the rest of the body, whose joints are magistrates and other legal officers, and so on. When Gray pursues this conflation of metaphors, Scotland becomes represented as a deformed female body. In fact, he suggests that she must be deformed in two ways at the same time: both a “longer neck than the poor lady’s height” and the monstrous existence of “a different and much stronger body.” While this imagery is used to make a point about the effect on Scotland of being part of the United Kingdom, and to suggest that monstrous political processes are at work, it also rather suggests that Scotland is necessarily deformed in some way. According to Gray’s rather brutal logic, if Scotland is to be represented as a woman, she cannot be anything but deformed, intrinsically divided between Scottishness and Britishness. Such a deformed body would be quite difficult to write into a work of fiction, but in the figure of Bella Baxter (Bella Caledonia) Gray is able to demonstrate the metaphorical distance between her head and her body without resorting to physical monstrosity. Godwin Baxter creates Bella by placing the brain of an infant within the body of an adult woman: this is what makes her monstrous, and able to incarnate the monstrous and deformed body of state. At the same time, Bella’s external beauty masks a monstrous political reality, as does the traditionally accepted photogenic and attractive appearance of Scotland. The deformed body of Bella Caledonia may have some roots in the critical history of the notion of the “Caledonian antisyzygy”, that heavily overused term in Scottish literary studies. First coined by Gregory Smith in Scottish Literature: Character and Influence (1919), “Caledonian antiszyzgy” was Smith’s playful term to describe the doubleness, contrast and union of opposites which he claimed characterised Scottish literature. Smith’s essentially positive characterization of Scotland as diverse and dialogic was picked up by Hugh MacDiarmid, but many subsequent critics have used the idea of the “Caledonian antisyzygy” to express a view of Scottish literature – indeed the Scottish nation – as essentially split, dual and schismatic. As a result, the notion of the “schizophrenic Scot” has become disturbingly recurrent in Scottish literary criticism. Identifying “Scottishness” in terms of a troubled mental state is not so far from Gray’s personification of physical deformity in the figure of Bella Caledonia. In either case, the political disjunction between Scotland and Britain is represented as illness, in one case of the allegorical body of Scotland, in the other of the minds of the Scots. The way in which Gray fictionalises the deformed body of Scotland in Poor Things brings both metaphors together. Instead of representing Scotland by either a deformed body or a split mind, Gray emphasises the split between body and mind. So the “monstrous” anatomical construction of Bella is focused upon her brain, and this raises several problems, both in the interpretation of the dual narratives of the story and in its implications for a political reading of the construction of Bella. Bella has to correct the assumption that Shakespeare and Walter Scott belong to the same national literature, drawing attention once more to the British/Scottish dichotomy. But she takes on board the Russian gambler’s thesis that a nation’s consciousness can only be as old as its literature, no matter how long it may have existed in statute. If Pushkin “made Russia a state of mind – made it real”, then a nation can only be real if it has been imagined. If literature creates a nation’s “state of mind”, Bella’s brain may represent that state of mind contained within her body which is Bella Caledonia, the physical existence of the nation. Just as Bella’s mind is younger than her body, so Scotland’s modern national consciousness is younger than the nation and the nation’s cultural heritage. But the allegory also works for the state-nation dichotomy. The parliament of an independent Scotland would be much younger than its mother nation, since it has been interrupted for 300 years. The current devolved Scottish parliament is indeed in its infancy and has been transplanted into the body of a mature, post-industrial nation. The connotations of the baby’s brain in the adult body are not entirely negative. Bella has an attractive innocence and a political idealism resulting from her lack of social conditioning. She becomes the first female doctor to graduate from Glasgow University, and opens a clinic run on socialist principles, although she is ridiculed by the press. Although the theme of monstrosity suggests political imperfections in Scotland, Bella is not the same kind of monster as the two-necked monster of Why Scots Should Rule Scotland. Her social conscience may be read as a potential future for Scotland. Monstrosity is translated into potential. Bella’s infant brain may represent “the early days of a better nation” of Gray’s recurrent slogan. In Poor Things Gray takes a tradition of seeing Scotland as essentially divided and transforms its allegorical potential into something still monstrous yet potentially positive, reappropriating the celebratory approach to the Caledonian antisyzygy found in Smith and MacDiarmid. The deformed body of Bella Caledonia need not be read negatively. Gray highlights the discourses of monstrosity in the cultural and literary construction of Scotland and proposes an allegorical body in which different constructions of Scotland can co-exist. He opens the door to new narratives of Scotland in which both Scotland and women can be theorised without being critically deformed in the process. This is an edited extract from Kirsten Stirling’s Bella Caledonia: Woman, Nation, Text (Rodopi 2008), with special thanks to the author.